NASHVILLE, Tenn. - The state attorney general wants the country singer who made the song "Redneck Woman" a hit to stop "glamorizing" the use of smokeless tobacco at her concerts. 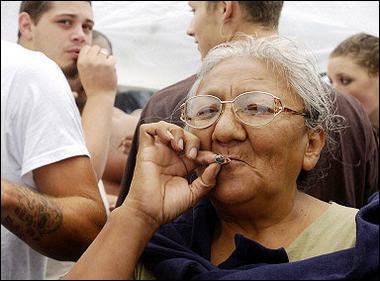 An older woman smokes a marijuana joint at Hempfest in Seattle, Washington. More than 150,000 people were expected to attend Hempfest at Seattle's Myrtle Edwards Park on Seattle's waterfront 21-22 August 2004. The event is billed as the world's largest drug-policy reform rally.